For college students, summertime is a much needed break from a stressful school year. Nevertheless, many Manhattanville undergraduates decide to opt out of sunny beaches and enroll in a variety of summer classes offered by the College in order to speed up their studies or simply to immerse in an intellectually engaging subject. This year, a newly developed Communications seminar called Social Media gives students a chance to not only become involved in an academic discussion of the topic but also to actually create a social media strategy by partnering with a department on campus as the class’ “client.” The students chose to collaborate with Manhattanville’s Alumni Relations Office for this special project. Professor Brian Snee, Chair of the Communications Studies department and instructor of the course, considered the class to be closer to a workshop than a traditional seminar course. Besides reading books and articles, students worked together to create a social media product for the Alumni Relations office. “We are experimenting with the form of this class, which is itself about experimental forms of social media,” Snee shared. Over the course of the project, students in the seminar went through an incredible number of photos in addition to categorizing the pictures into years and genres to make the archival procedure much easier for Alumni Relations Office going forward. They also prepared a proposal that outlined detailed suggestions for the office’s social media campaigns. Despite the strenuous nature of the process, Erika Iroff ’16, who is majoring in the newly introduced Digital Media Production program, shared that she enjoyed these class assignments. “I came to the class thinking that I would just be talked at but learning that we could actually produce something together is very exciting since we don’t usually get to do that,” Iroff said. The Social Media seminar attracted students across academic disciplines. While McIver, Iroff and Brandon Hight ’15 all major in Communications, Thomas Batjaka ’15 is a Psychology major. The Social Media seminar’s project once again highlighted the connection between current students and alumni within the Manhattanville community. More importantly, this collaboration has also sprung a new feature on the office’s Facebook account. 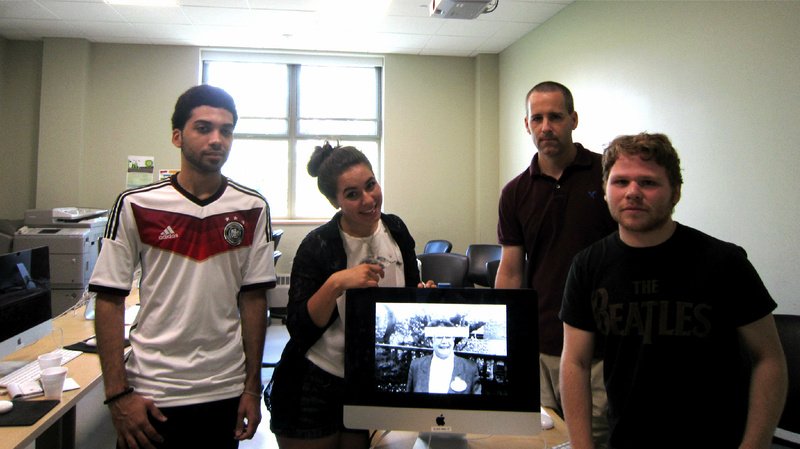 Beginning in September, every month we will feature a slide show featuring a specific class year or campus program to celebrate the legacy of Manhattanville College. Please click below to for a sneak peak of the photos that the students have collected during the project and be sure to follow our social media accounts to see all pictures and information that will be shared by the Alumni Relations office throughout the year. Find us here on Facebook, Twitter and Instagram. This sounds interesting. Is Professor Snee willing to share the reading list? I earned an MA in Communication more than five years ago, so I’d love to read more up-to-date materials. Thanks!